Transform your dry, cracked lips with the La Roche-Posay Nutritic Lips balm, a caring stick that tackles the four signs of sensitive lips. The non-greasy balm is made up of biolipids and ceramides 5 which work to offset hydration deficiencies and reinforce the skin barrier over time. Pulling, fragility, fineness and chapping are reduced, and the lips are cocooned in moisture with each and every use. The lips are left looking and feeling comfortable and nourished, with a subtle sheen. Use as often as necessary to protect the area. 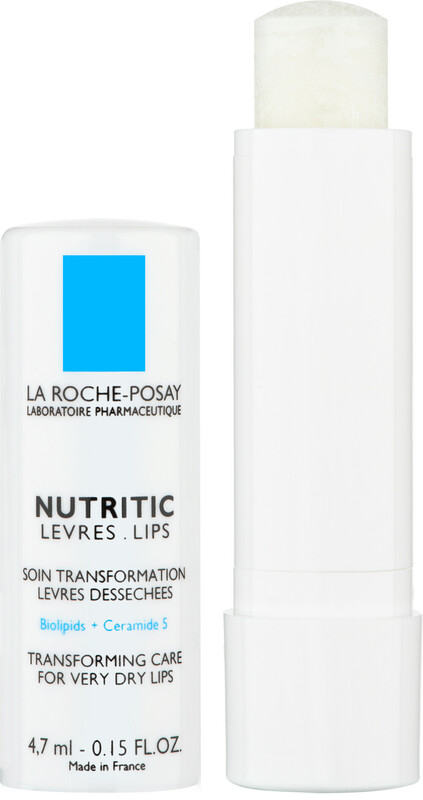 La Roche-Posay Nutritic Lips 4.7ml is rated 4.4 out of 5 by 8. Rated 5 out of 5 by BasaBasa from Wonderful for chapped, dry lips This morning my lips were in dreadful shape - chapped, dry & hideous with lipstick on. I'd been using other lip balms and salves but nothing really worked to be honest, the dryness returned quite quickly. However, after just a day using this my lips have transformed. It's a colourless, scentless product but it has staying power, it feels light and nourishing and it works. 10/10! Rated 5 out of 5 by Tintin01 from Great This is a long-lasting, effective, non-cloying lip balm. No horrible taste, no slimy texture - just does what it says on the tin. it keeps lips soft and comfortable in all weathers. It costs a little more than other balms but I find it lasts longer and is good value for money. Rated 5 out of 5 by Grandmacarol from Very nice I don't understand why someone said that this was 'hard' because I did not find it so. After the first use, it just slides on and feels very nice. I tried it to see how different it is to the one I usually use. I like it very much but will buy the other in future. No reason really but I love Avene and the other is from their range. Rated 1 out of 5 by SabrinaK from Absolutely terrible!! Easily the worst lip product I've ever used. It's hard, doesn't spread and feels like plastic. I'd have given this zero stars if that had been an option!